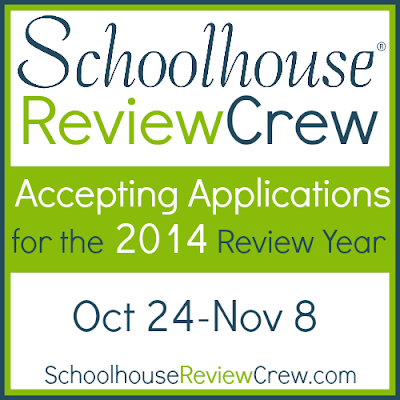 The Schoolhouse Review Crew is now accepting applications. This year was my first year on the crew and I can not tell you how much God blessed me with getting to try out different types of homeschool curriculum. When I joined I knew that was what I was going to be getting. However I did not know I would be getting to know some wonderful women (and one man). These women were there for prayers, to chat, and to help along the way. They helped me in life not only homeschool. I will be applying again this year hoping that God has in store another wonderful year for me with this group. If you enjoy blogging, are homeschooling, and want to be able to review some great stuff apply now! 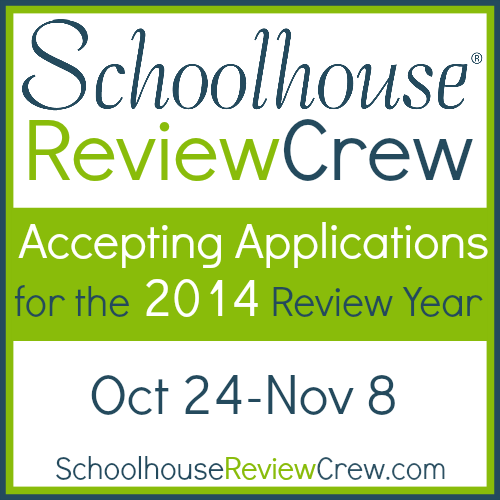 The Schoolhouse Review Crew will be taking applications for the 2014 Review year from October 24 - November 8! Are you a curriculum junkie? Do you enjoy writing reviews? Then you might be perfect for the Crew! First of all you must be a homeschool mom or dad. You don’t have to homeschool all of your children, but you must homeschool at least one. You must be willing to use the review products for about six weeks in your homeschool, before writing your review. Review periods have deadlines and requirements for the reviews. You must be willing to follow these requirements. No, that doesn’t mean you must write a positive review. But it does mean that there are certain elements that are required. And the deadlines are firm. If you are often late for deadlines, the Crew is probably not for you. You must have a blog on which to publish your reviews, and be sure you have an active blog with a following. By active blog, I mean that you should be blogging regularly, at least weekly, about your family and homeschool (in addition to your reviews). Your blog should have followers — RSS feed or email subscribers, as well as in social media. The Crew does not accept brand new bloggers who just set up their blogs for the purposes of applying to the team. Are you using social media to promote your blog? Activity on at least one social media platform is a requirement to serve on the Crew. Which one is up to you — Facebook, Twitter, Pinterest or Google Plus are the options. You will need to be willing to promote your reviews there and post a widget or plug-in publicly on your blog, indicating how many followers you have in social media. You must be willing to check into the Crew's Review Management forum. This is where information is disseminated to the team. The leadership does everything possible to make things easy for us, outside of writing the actual review, but you need to be willing to participate by checking in almost daily. Sample reviews are helpful. If you’ve never written a review on your blog, go ahead and write one for curriculum you are currently using in your homeschool. This will help the leaders see how you approach writing reviews. Why should you want to be a part? Our Crew of over 250 review bloggers has been serving the homeschool community for more than 5 years. As a respected review team, we take this job very seriously and will insist you do as well. The leadership provides an incredible amount of assistance to help us be the best bloggers, homeschool parents, and of course, reviewers we can be. They provide a mentoring program for new members, a social media networking group, many blog and social media tutorials, and lots of incredible opportunities for our team, including blog carnivals, the opportunity to guest post on the Crew blog, and the blessing of some incredible friendships. After making sure you meet all of the requirements, if you believe you would to an asset to the Schoolhouse Review Crew and wish to join us, please click over to the Schoolhouse Review Crew blog to apply. Come be a part of The Old Schoolhouse family! I can promise you that if you decide to join this wonderful Crew you will be blessed in more ways than one.